The company logo of ZTE is seen through a wooden fence on a glass door in Beijing, China, April 18, 2013. U.S. lawmakers on Tuesday rejected any plan by President Donald Trump to ease restrictions on China's ZTE Corp, calling the telecommunications firm a security threat and vowing not to abandon legislation clamping down on the company. 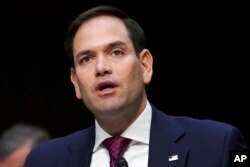 “They are basically conducting an all-out assault to steal what we've already developed and use it as the baseline for their development so they can supplant us as the leader in the most important technologies of the 21st century,” Rubio said at a Foreign Relations Committee hearing on Asia policy. U.S. companies are estimated to provide 25 percent to 30 percent of components used in ZTE's equipment, which includes smartphones and gear to build telecommunications networks. Sen. Ron Wyden, D-Ore., the ranking member of the Senate Finance Committee, arrives for votes at the Capitol in Washington, Oct. 19, 2017. 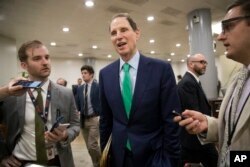 ​"Who makes unilateral concessions on the eve of talks after you’ve spent all this time trying to say, correctly in my view, that the Chinese have ripped off our technology?” Senator Ron Wyden, the senior Democrat on the Senate Finance Committee, which oversees trade policy, told Reuters. Another Republican, Senator John Kennedy, defended Trump, saying the president's approach is part of a larger set of negotiations with China.